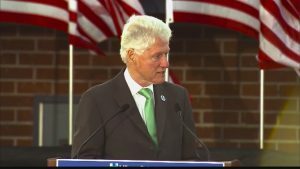 Former President Bill Clinton this week criticized the signature policy reform of current President Barack Obama while campaigning for his wife Hillary, the Democratic Presidential nominee. Clinton ripped the Affordable Care Act, also known as Obamacare, for flooding the healthcare insurance market as well as causing premiums to increase for the middle class American, who does not qualify for any subsidies. Clinton said you have this crazy system where 25 million more Americans have healthcare and then those who are out working hard, sometimes putting in over 60 hours per week, end up with premiums that are double and coverage that is 50% less. However, the following day Clinton tried to back off that a bit. He said the ACA did a great deal of good and the efforts to have it repealed by the Republicans are a mistake. He added that for the first time in the history of the country, healthcare insurance is being provided to over 90% of the people. However, he continued, a group of people exists, which are mostly owners of small businesses and employees that earn just too much to qualify for the expansion of Medicaid for the tax incentives who cannot get health insurance premiums that are affordable. Donald Trump the presidential nominee from the Republican Party said on Tuesday that he bet Clinton was troubled on Monday night by his wife for what he said. Trump than added that there were many nights that were hell for him with Hillary. Bill Clinton, whose efforts aided by wife Hillary to overhaul healthcare during the 1990s were stymied by Congress and the medical insurance lobby, said that the insurance does not make sense and does not work here. Touting the proposal of his wife to allow people that do not have access to the subsidies to purchase into Medicaid and Medicare, he acknowledged that solutions that are market based would not solve the problems of the country with insurance coverage and costs. The press secretary for Clinton, Angel Urena said that the stance of the former president on Obamacare is that he always supported the legislation since 2010 when it was enacted. On Tuesday, the White House again said that there were some changes that they would like to see made on ACA, but the White House insisted that Obamacare is still a top accomplishment of President Obama’s tenure.